ROME (CNS) — Priests in central Italy were instructed to celebrate Mass outdoors following another devastating earthquake that rocked the region and brought one its most spiritually and historically significant churches tumbling down. Cardinal Gualtiero Bassetti of Perugia-Citta della Pieve advised priests to not celebrate Mass indoors over the next several days, including Nov. 1, the Solemnity of All Saints, which is also a national holiday in Italy. The 6.5 magnitude earthquake struck Norcia in the early morning Oct. 30 and reduced the Basilica of St. Benedict to rubble. At the noonday Angelus Oct. 30, Pope Francis prayed for the “the wounded and the families that have suffered major damage as well as for the personnel involved in rescue efforts and in aiding the victims. “May the Risen Lord give them strength and Our Lady watch over them,” the pope said. 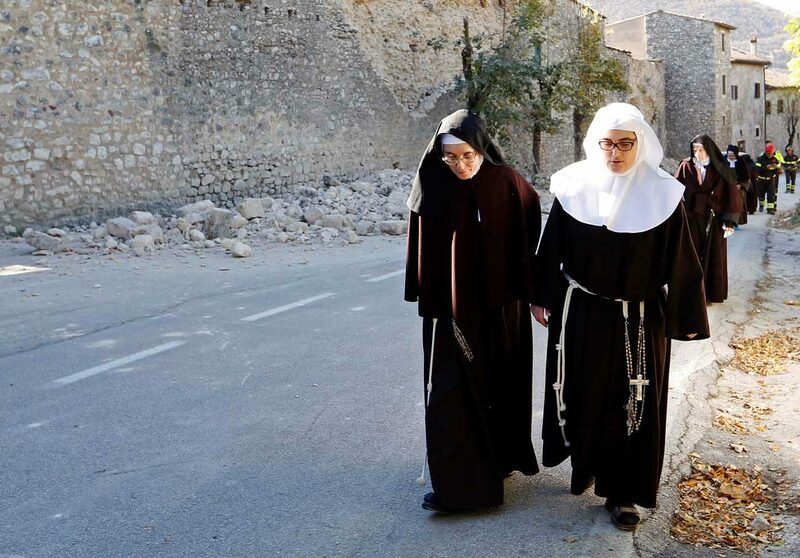 The Benedictine monks of Norcia assisted in relief efforts as well as helping to guide anxious residents to the town’s main square and lead them in prayer. “After offering spiritual support to the people in town following this morning’s intense earthquake, the entire monastic community is together again at our mountain monastery which overlooks a now fractured Norcia,” the monks said in a message posted on their blog. While there were no deaths and some 20 reported injuries, it was the strongest quake in Italy since 1980 when a 6.9 earthquake struck the southern region of Campania. The quake was felt along much of the Italian peninsula including 100 miles away in Rome, forcing city officials to close subways and several churches in order to assess any damage. Rome’s mayor Virginia Raggi also ordered schools to be closed the following day while the safety of the buildings was checked. Vatican firefighters assessed potential damage to the four major papal basilicas in Rome, which were later reported to be safe and open to the public.